24 LED and Unique Wide Angle Design Outdoor Solar Light This solar motion light just shines brighter due to the 24 powerful LED lights, which is far more brighter to provide security for your home or business accommodation. 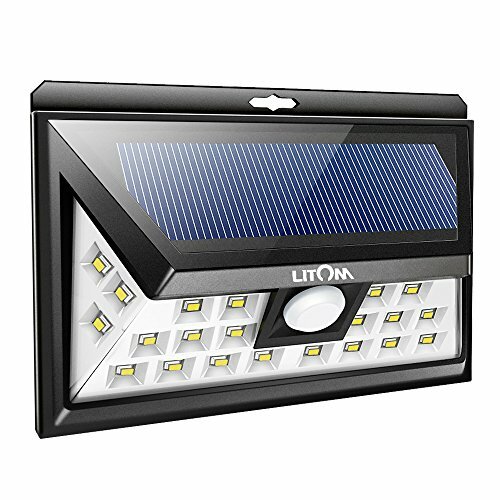 120 Wide Sensing Range Litom Solar motion light installed with sensitive sensor ballhead,The recommended install height is 5.6-6.6 FT, it can detect motion up to 10-26 feet away at a 120 degree angle. This solar power motion light automatically turns on when it senses the motion of someone driving to your house or walking to your door. 3 Different Sensing Modes Come with 3 different lighting Sensing modes: medium light mode, dim light sensor light mode and sensor mode. Choose the most appropriate mode for your needs and desires. Simple Installation This solar motion sensor light can be mounted on the wall with provided wall plug and screws in seconds, no cable or wire necessary. Tips In winter, the solar light is not able to be fully charged for the lack of light. So it's normal if the solar light is not bright enough and illumination time is short. Light time depends on how much it is charged during the daytime. Warranty The product includes a 45 days money back & 18-month warranty. The AmeriTop Solar Motion Sensor Lights is brighter than other similar solar lights, has lasting and consistent in good performance. By choosing our product, you will have a unique wonderful experience. Its outstanding quality standards provide efficient lighting and adds extra safety for your house. 3 Modes Available: Test Mode, Auto Mode, Permanent On. Function: To test the light before using for the first time or after maintenance. Auto ON when motion is detected and auto off after lighting up for 6 seconds, if no further motion is detected. Function: Only work at night. Auto ON for pre-determined time(30S/60S/120S) when people or other living objects are detected within the sensing area, and Auto OFF after no further motion is detected. Function: this LED Solar Security Light will emit 1500lm great brightness constantly. And OFF MODE is also available if you want it to rest for a short time. The charging time and the lighting time of the solar light varies with sunlight intensity, geographical location, weather conditions, seasons and other conditions. In winter, solar light can't get enough energy from sunlight, so it is normal that it has lower brightness and shorter working time at night. 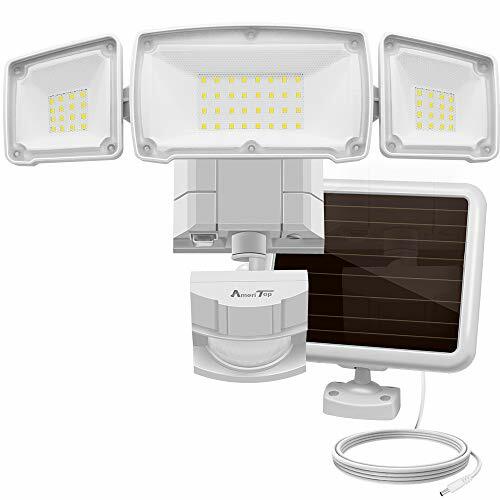 Ultra Bright Outdoor Solar Lights - The AmeriTop solar security light with the three heads design, produce up to 1500lm 5000K high brightness output and good heat dissipation, which is far brighter than other similar LED solar lights. It is rechargeable by High Efficiency Solar Panel, reach full charge within a few hours. Compare with other solar panels, it still can obtain low current charging in the cloudy/rainy days or in areas where sunlight is insufficient. Larger Lighting Area - With the innovative wide angle and three heads design, Adjustable heads can move upwards, downwards and horizontally. Up to 180 wide sensing angle and 49ft sensing distance, Easy to adjust the light heads, lens hoods and motion sensor to different angle as your requirement. Lighting direction is adjustable with the three flexible light heads, save your trouble to install two extra light. No need for electricity, environment friendly product. Smart Motion Sensor - The solar light has daylight and motion sensor. The AUTO MODE (Dusk to dawn) Auto ON for pre-determined time(30S/60S/120S) when people or other living objects are detected within the sensing area, and Auto OFF after no further motion is detected. Built-in PIR motion sensor of our solar lights, it has a long range of distance and a wide angle for motion detection. Sensing range and sensitivity are both 20% higher than general solar lights, bringing ultimate using experience. Security & All Weather Resistant - The robust die-cast aluminum housing and impact-resistant PC lens ensures this 3 head security light fixture can stand up to the elements and bad weather. IP65 waterproof rating ensures that your 3 head security light fixture won't give in in rain, sleet or snow weather. It's specifically designed to withstand extreme weather conditions, all weather resistant and provide additional safety and security for your home. Flexible & Easy Installation - The solar panel has 15foot cord and can be placed almost anywhere around your house. No main power or wiring required, this easy-to-install solar panel can be fixed on any exterior wall constructed of all types of material including metal, wood or plastic. Perfect for outdoor lighting and can be widely used as yard light, garage light, garden light, parking lot light, exit light, entrance light, driveway light, patio light, entryway light etc. Charge the solar light for 6-8 hours under the sunshine before first using. like fence, patio, deck, yard, garden, step and other outdoor places. As a weatherproof motion sensor solar light, it s environment friendly design. In day, it is auto off and collect sunshine for being charged. At night, there re three modes as below, and it s energy saving to provide you two different illumination solutions. As it only takes 6-8 hours to be fully charged, its short charging time is ideal for those short winter. It can be auto on and can last for 10-12 hours at night once fully charged, no worry of short time of light at night. Stay dim (18 LED) at night, it will be high light (44 LED) and last about 15 seconds once motion is detected. The light will be high light only if movement is detected at night and turn off after 15 seconds. Ultra Bright LED: The upgraded 44 chip can make more area super bright, ideal choice for fence, patio, deck, yard, garden, step. Unique Lighting Modes: Motion sensor mode. It auto turns on bright light for 30s when motion detected. Which can satisfy your demands in energy saving way. Last Longer with Upgraded Battery: Rechargeable 1800mAh battery make the solar light fully charged by sunshine. Waterproof : IP64 design make the solar lights function well even in rainy days. UNIQUE WIDE ANGLE DESIGN With three-sided offers wider range illumination, the LED on both sides provide enough extra light, which is different with those lights on the market. 3 WORKING MODES Medium light mode/Dim light sensor mode/Motion sensor mode to meet your different needs, you could choose the suitable mode. SOLAR POWERED&SUPER BRIGHT We designed our solar lights with 24 led lights, Built-in 18650 lithium rechargeable battery (1800mAh), Light up 4-6 hours after fully charged. WEATHER RESISTANCE IP65 waterproof and heatproof which can withstand rain, snow and other extreme weather conditions. It is offered with 1-year and lifetime friendly customer service. 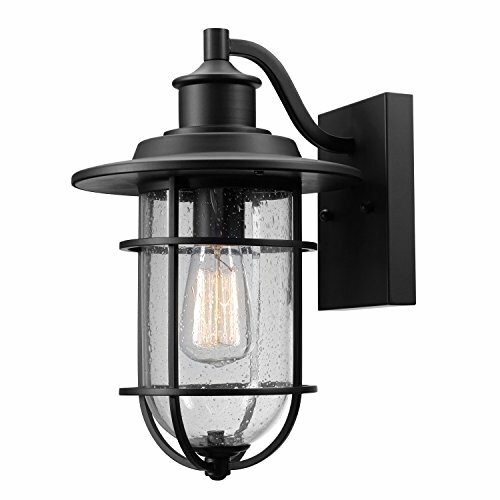 Perfect to hang alone or as a pair, Globe Electric's Turner 1-Light Outdoor Wall Sconce provides a warm welcoming light. The seeded glass shade creates a wonderful shadow that provides an inviting light for your entryway. Add this by your garage door, back entryway or anywhere you need light outside your home. 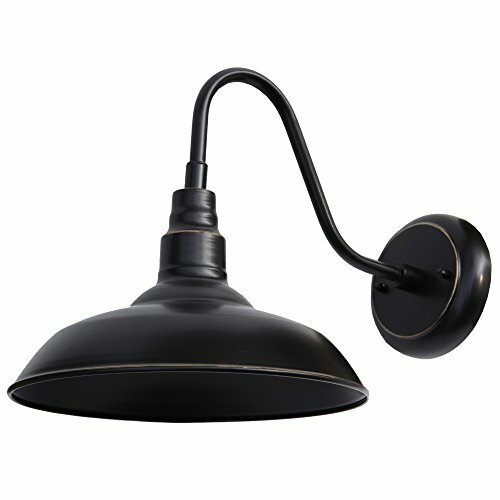 The black finish and clear shade are a perfect combination of classic and modern and will blend well with any decor. Add a compatible dimmer switch and bulb to create the perfect outside atmosphere. 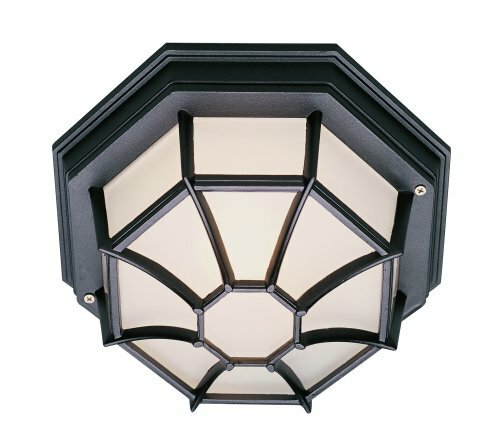 Check out Globe Electric's stunning array of designer vintage bulbs to make your Turner 1-Light Wall Sconce truly unique. Includes all mounting hardware for quick and easy installation and requires one medium based 60W bulb (sold separately). 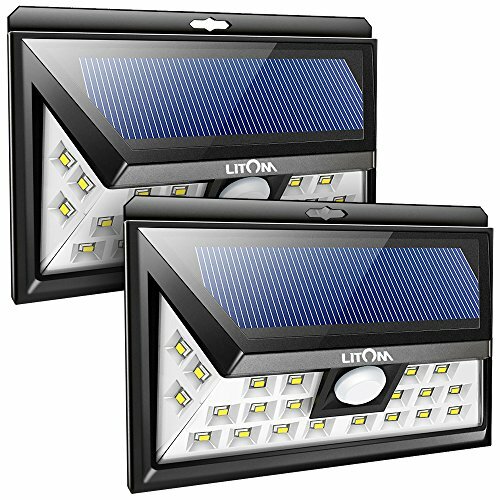 LITOM Solar motion light installed with sensitive sensor ball head. The recommended install height is 5.6-6.6 FT, it can detect motion up to 10-26 feet away at a 120 degree angle. This solar power motion light automatically turns on when it senses the motion of someone driving to your house or walking to your door. This light fixture is dimmable. The Philips Hue Econic family offers 16 million colors to enhance the beauty of your porch or yard, and to create any ambiance you like to optimize your smart home. 50,000 shades of white are also available to brighten your outdoor space for evening activities or to enhance security. Easily connect to your existing Philips Hue Hub to get all the smart features including away from home control, geofencing, scheduling, or linking to the Philips hue Outdoor Motion Sensor. The Econic family is fully weather-proof and must be hard-wired. Hue hub not included. 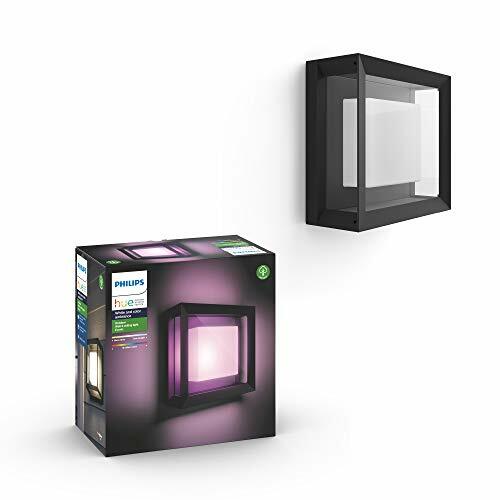 BEAUTIFUL DESIGN / SMART CONTROL: Philips Hue Econic Smart Outdoor White & Color Wall & Ceiling Light Fixture lets you control your outdoor lights using your Philips Hue Hub (Hue App), Hue Smart Accessories, Voice Assistant or Smart Home Device (sold separately). Its contemporary design fits in with any existing outdoor d cor, creating an aesthetically pleasing smart home. EXTREME RESISTENCE: The robust outdoor design of the outdoor lighting fixture is designed to survive the elements, year on year. OPTIMAL LIGHTING EXPERIENCE: Balanced, well distributed light in every color, the econic outdoor wall and ceiling fixture is designed to ensure sufficient light is provided in every application. EASY INSTALLATION: Install the Hue Econic Wall and Ceiling fixture in a matter of minutes. It is easy to install using included hardware. Hard wired. LIMITLESS POSSIBILITIES: The Econic Smart outdoor wall and ceiling light comes equipped with different mounting components. Wall or ceiling mounted. 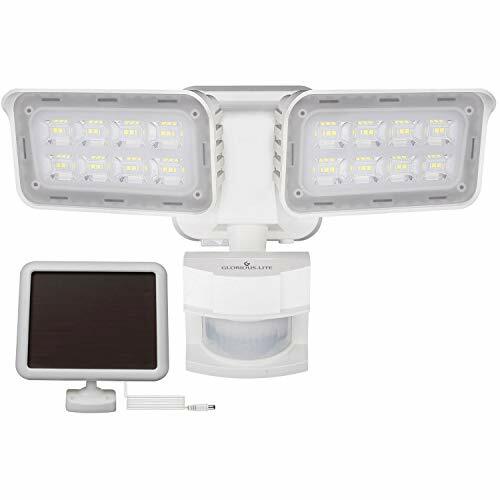 It's perfect for front yard lighting, deck lighting, porch lighting, around the door, garage or any place around your smart home where it matters. 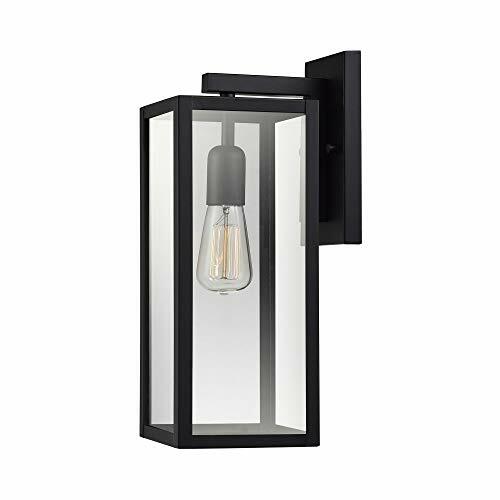 Globe Electric sebastien outdoor wall sconce is a wonderful combination of clean and curvy lines that create a pleasing design. The Black Finish upscales any decor. The white interior reflects the light and ensures a beautiful brightness level no matter which bulb you use. Check out Globe Electric Collection of vintage inspired Edison bulbs to create a look that is truly your own. 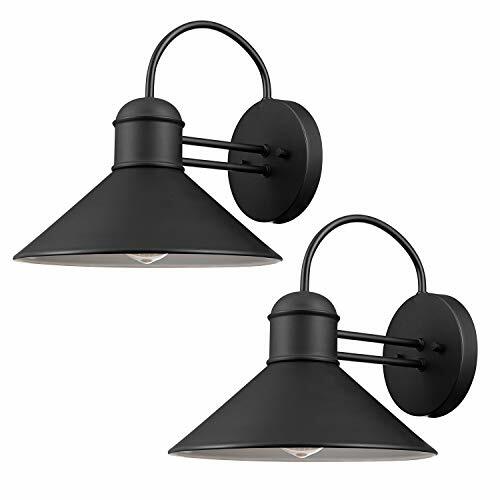 Place these sconces together to decorate your entranceway or garage or place them separately to create a unified look all around your space. Add a dimmer switch to create the perfect ambiance and mood for any occasion. Includes all mounting hardware for quick and easy installation and requires two 60W medium base bulbs - one per fixture (sold separately). By choosing our product, you will have a unique wonderful experience. We devote to building an honest, friendly and harmonious relationship with our customers. These outdoor solar powered wall lights will not only light up each dark corner of your garden, but also for your family emergency lighting use! Every modern family deserves to have them! This dial determines the range of the motion detector. Maximum position-Maximizes sensors range (32.8 FT). The time adjusting dial will set the duration of time the light will stay illuminated after motion has been detected. The time can be adjusted from 5 seconds up to 180 seconds. Rotating the dial clockwise will extend the time the lamp is illuminated. LUX: This is the level of darkness reached before the light turns on. If counter clockwise rotation set to the SUN logo, the light will turn on in most situations ranging from dusk to daylight. If clockwise rotation set to the MOON logo, the sensor will only trigger when it's dark. This is the most idea position for general evening and night. Brighter & Wider Solar Lights - The Lovin Product solar light Combining 182 pieces of high power LED beads with the innovative wide angle and three heads design, provide excellent illumination of up to 1000 lumens, which is far brighter than other similar LED solar lights. Adjustable heads can move upwards, downwards and horizontally, which allow for maximum lighting coverage. Provide lighting and security to your garage, pathway and more. High Efficiency Solar Panel - Our solar light has a upgraded World leading 9V 2.5W Polycrystal silicon solar panel, which photoelectric conversion rate is double higher than other solar panels. It is made of high conversion efficiency polycrystalline silicon solar cells, tempered glass, EVA, transparent TPT back sheet and aluminum alloy frame, optimizes light source converted to electric current and stored in the batteries. Incredible photocell efficiency, reach full charge within a few hours. Smart Motion Sensor - The solar light has daylight and motion sensor that automatically turn off during the daytime and the light will automatically turn on at night when motion is detected. Built-in PIR motion sensor of our solar lights, it has a long range of distance and a wide angle for motion detection. Sensing range and sensitivity are both 20% higher than general solar lights, bringing ultimate using experience. Customize 3 Control Dials - Our lights have 3 Control Dials. You can adjust the light settings using the three control dials. The LUX dial control measure ambient light and determines when the unit will turn on as ambient light fades, if you adjust clockwise rotation set to the MOON logo, the sensor will only trigger when it's dark. The SENS dial controls determine the range of the motion sensor. The TIME dial controls how long the light will stay on after detecting such motion. Flexible & Security - The solar panel has 16.4 feet cord and can be placed almost anywhere around your house. No main power or wiring required. this easy to Mount on the wall using included screws. It's specifically designed to withstand extreme weather conditions, all weather resistant and provide additional safety and security for your home. It can be automatically detected any moving object near your house. Ideal for outdoor use for wall, patio, garden, porch, lawn, pathway, gutter, etc. The Benkert Collection is a low-profile style designed to cast a soft ambient light over a wide area. The distinct shape blends with any decor , while also illuminating a variety of outdoor living areas. The prominent web-like metal housing is an octagonal shape. The Benkert 5" Flushmount Lantern accepts a single light, has frosted glass panels and is offered in multiple finish choices. Bulb Type: Incandescent. For Outdoor use. This item is ok for vaulted ceilings. Type of glass is Frosted. The materials used are: Metal, Glass, Electrical. The Finish is Rust. Bulb base is E26. The bulb is not included. This item is dimmable. The bulb shape is A19. Wet listed. Warranty details: One year limited Warranty. Warranty: One year limited warranty. 2. Turn on the switch and select the preferred brightness level. Make sure this product is charged with sufficient sunlight for at least 3 hours. 3. Please clean the solar panel on a regular basis to maximize lifetime and efficiency of the solar panel. Super Bright Designed with unique COB LED technology - panel contains more light sources in the same area than standard LEDs could occupy, which greatly increase the lumen output. 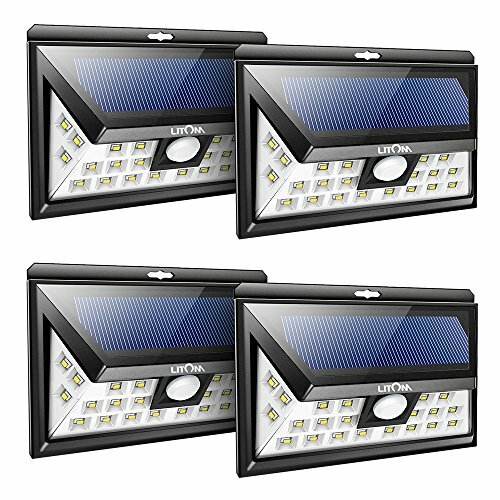 2X brighter than regular LED solar light in the market. 2 Convenient Modes Bright light sensor mode Dim light sensor mode. Light stays on for 40s once motion is detected, and auto prolonged when motion persists. Perfect Security Lights for patio, yard, garage, deck, garden, front door, pathways, and porch. All Day Working Light JUSLIT LED light absorbs and converts sunlight into electricity and stores in daytime. Built-in rechargeable battery (2000mAh), continuously light up for 6 hours as night light under Dim mode after fully charged. Reliable Long Life Span COB solar powered LED light can save energy, our high-quality ABS and IP65 waterproof protects battery to much longer lifespan. We offer 12-month warranty and lifetime friendly customer service. Why choosing our solar motion sensor lights ? - We pursue high quality and user-friendly design for our solar lights. 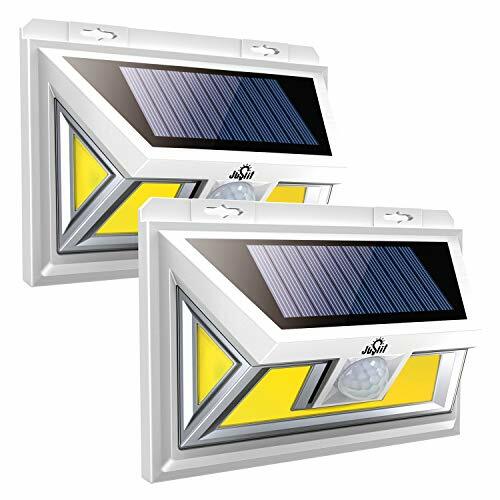 also these solar powered lights are charged by sunlight in the daytime and work at darkness or night when motion is detected, and will turn off automatically after 30s without the continuous motion. Sensitive & Wide Range Sensor----distance of 10ft and detecting a angle of 120 , integrated design of PIR motion sensor and night sensor, which provides wider illumination range and longer sensor length. Fast Charging & Long Working Hours----over 10-hour working time after charged fully under direct sunlight. Higher Photovoltaic Efficiency----5% higher than that of the poly-silicone panel. Motion Sensor: up to 3 meter and 120 degree detection range. 24-month warranty, and 7*24 friendly customer service. 100% Satisfactions and Money-Back GUARANTEED: We take full responsibility for our product and customer dissatisfaction. If you are not satisfied with the Solar lights outdoor, just return them within 30 days for a full refund or a new replacement. No questions asked, no hassle. 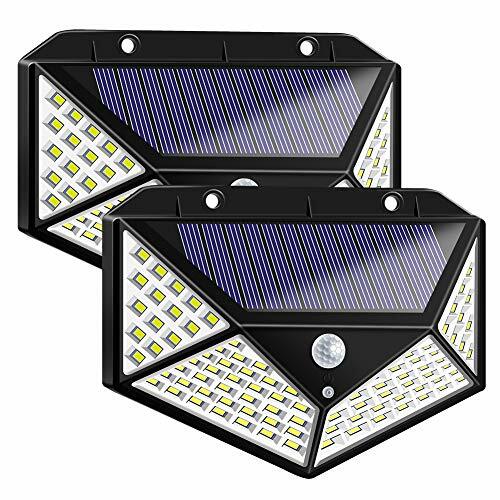 NEW TECHNOLOGY: Solar lights outdoor use the world's leading solar panels (monocrystalline silicon) to convert up to 19% of sunlight into electrical energy, charging time is at least 5% faster than other models of solar wall lights (polysilicon) on the market. Especially in winter or rainy days, when the light is not enough, save your charging time! 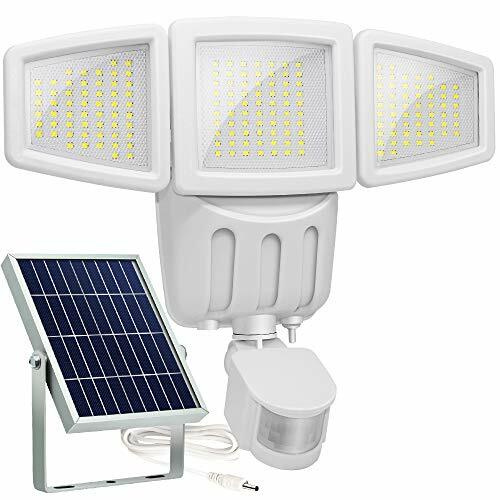 SUPER BRIGHT SOLAR POWERED LIGHTS: Solar lights outdoor equipped with 100 super bright LED beads, Solar motion senaor lights outdoor provides excellent illumination of up to 1000 lumens, Solar sensor lights which is far brighter than other similar LED solar lights. THREE MODES: Induction strong light is on, no induction light is off. induction light is on, no induction dim light semi-bright and semi-bright strong long light mode .This Solar Senstive Lights need not wire. Install the solar powered wall lights with screws provided and charge them fully under directly sunlight for 8-12hours. WEATHER RESISTANCE: Our units are made of high-impact ABS which can withstand snow, rain and other extreme weather conditions. 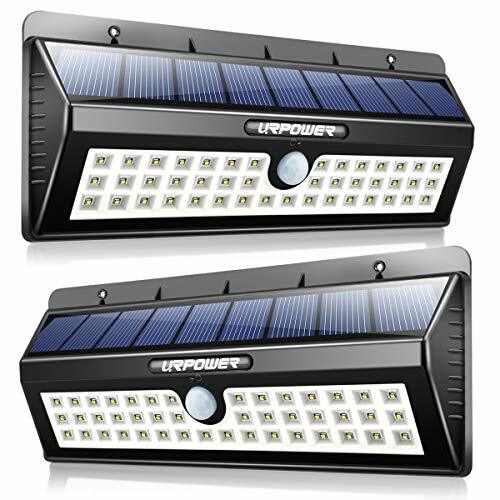 IP65 waterproof and heatproof, solar powered lights, suitable for most kinds of weathers. 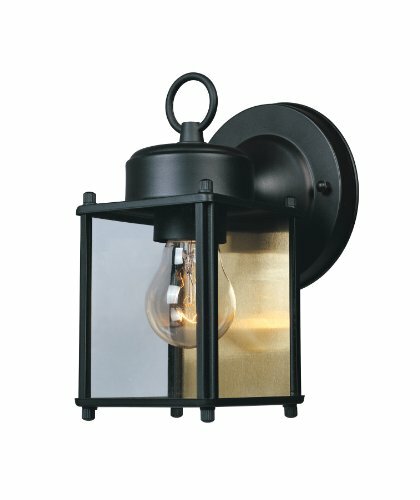 Great outdoor light for using on outdoor, garden, patio yard, deck garage, driveway porch. INTELLIGENT AUTOMATED SWITCH: Turn on at night when motion sensor detected , and automatically off after motion stops. Powerful sensor ball head offers strong motion sensitivity up to 9-17 feet and 120 degrees sensor angle. GLORIOUS-LITE store pursues high quality and energy saving products for customers, and we will keep our promise all the time. Featured with solar powered, flexible head design and long lifespan, this solar motion sensor light also enables to reduce your electricity bill by up to 80%. Perfect security light fixture for indoors and outdoors. Solar powered and environmental friendly. The solar panel is individual from the light fixture, which takes 3 days for a full charge (usually 2-3 days, depends on the weather.) Please make sure the solar panel is in a place where sunlight is sufficient and available. Solar motion light reduce your electricity bill and save the power up to 80%. With max sensing degree of 180 and max distance of 49ft. The sensing range and distance may vary depend on the installation height, installation way and the direction of sensor head. Flexible, moveable and help you customize light in different angle to secure the place you want. Make sure the light is vertical installation instead of horizontal one since the horizontal installation will affect the joints and limit the angles. 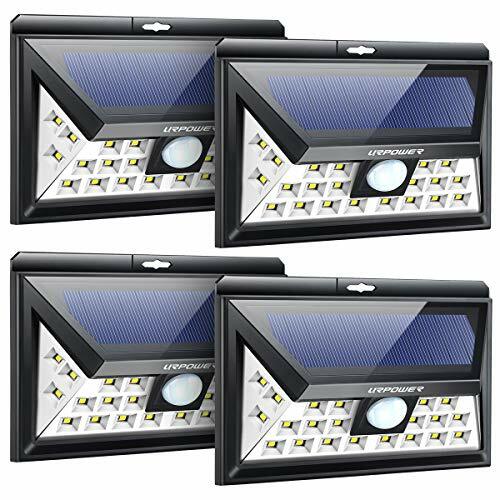 Solar-Powered & Super Bright: This led security light is solar-powered, produces up to 1500 lumens super bright light and good heat dissipation. Using 3000mAh lithium-ion rechargeable battery, the solar security light saves electricity bill by converting the sunlight into electricity and stores in daytime. It lights up when sense motion at night.The amorphous silicon solar panel is with 15ft cord for easy installation. Please put the solar panel in place where sunlight is sufficient &available. IP65 Waterproof: IP65 waterproof rating ensures that your 2 head outdoor solar security lights fixture or outdoor lights can withstand rain, sleet or snow weather. As motion security lights, it's perfect for entryways, stairs, yard, workshops, fence, patio, play court, garden, lawn and other outdoor sites or area lighting requirements. Motion Sensor & Adjustable Design: The solar motion light provide maximum of 180 degree sensing range and up to 49ft sensing distance. Both light heads are easy to move and adjust, the PIR sensor head is flexible for different angles to satisfy your needs. Please make sure there are no other ambient ray/ infrared light around or point to the sensor head. 3 Convenient Modes: TEST/ON/AUTO modes to meet your different lighting needs. Test mode only for testing before using in the house and lights up for 5-6 seconds. On mode means normally on, the light will stay on about 1 hour after full charge. Auto mode is when the light sense the motion, it lights up from 30 seconds to 2 minutes(max) according to the pre-setting. Glorious-Lite Warranty: We offers 12-month warranty and 2-month payback guarantee for every customer. If you have any questions or concerns, please feel free to contact us. We are here to help! GLORIOUS-LITE store pursues high quality and energy saving products for customers, and we will keep our promise all the time. Featured with super brightness, flexible head design, long lifespan and good heat dissipation, this outdoor security lighting also enables to reduce your electricity bill by up to 80%. Perfect flood light fixture for indoors and outdoors. The led flood light produce up to 3000 lumens light output and provide efficient lighting to different places. The light head and the sensor head are flexible, moveable and easy adjustment to different angles. Help you customize light in different angle to secure area or place you want. Also it is switched controlled, easy installation with direct wire. Super Brightness & Long Lifespan: The led flood light produces up to 3000 lumens high brightness and the light head is with die-casting aluminum material which have better heat dissipation and other part is PC. The outdoor floodlight lasts and consistent in good performance thanks to long lifespan rating of up to 50000 hours. With led beads, this energy-saving and environmental friendly product reduce your electricity bill by up to 80%. Adjustable Design: The lamp heads and sensor head are adjustable and flexible, easy to adjust to different angle as your requirement. Help you customize the angle to the area that needs lightings. IP65 Waterproof & ETL-Listed: IP65 waterproof rating ensures that your 3 head outdoor led lights fixture or outdoor lights can withstand rain, sleet or snow weather. 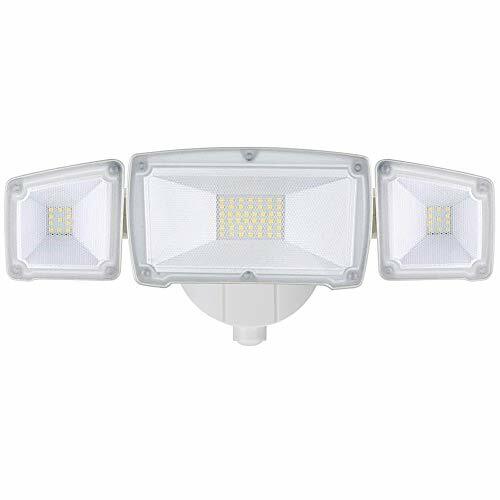 As outdoor led flood lights, which is perfect for entryways, stairs, yard, garage, workshops, fence, patio, play court, garden, warehouse, lawn and other outdoor sites or large area lighting requirements. ETL- Certification with outstanding quality standards provides efficient lighting and adds extra lighting for your house or yard.